Set up any of these daybeds as seating that doubles as sleeping quarters, and you can start filling the calendar with visits from friends and family. Among the everyday struggles of finding storage and squeezing in more workspace, entertaining—and housing—guests poses a conundrum for most homeowners with small spaces. Specifically, where will overnight guests sleep when they come to visit? While some solutions, like the fold-up Murphy bed and stow-away trundle bed, focus on hiding spare sleeping arrangements out of sight, a daybed offers in-plain-sight functionality. Couch by day and bed by night, it’s the most practical furniture solution to an all-too-common problem. So, whether you’re looking for an extra spot for overnight guests to snooze or simply a cozy place to curl up with a book, consider setting up one of our five favorites in your own space. 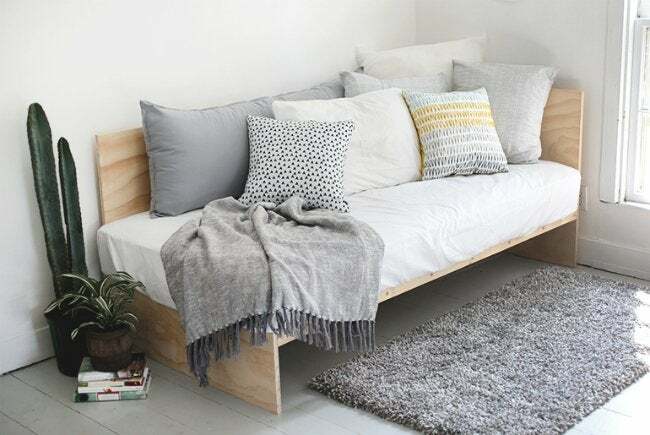 Create a hard-working, functional piece of furniture on the cheap following The Merry Thought’s lead—more specifically, the DIY blog’s detailed plans for a plywood daybed. As all levels of woodworkers may know, this inexpensive material won’t break the bank or leave you scratching your head during construction. Best of all? You won’t sacrifice any style by choosing this simple, minimalist design. 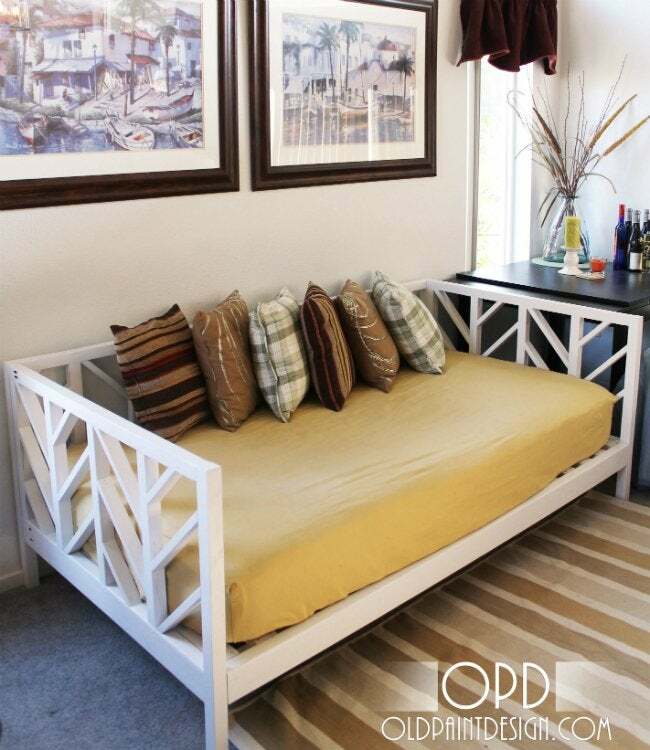 Fully made up, the bed’s unique asymmetrical frame fits perfectly into that unused corner of your space. If you already have a twin mattress set on hand, convert it into a daybed by simply changing its orientation and adding legs. To recreate this brilliant conversion from blogger Ashley Rose from Sugar & Cloth, all you need is a set of mid-century modern style wooden legs, stained to match your space’s décor. 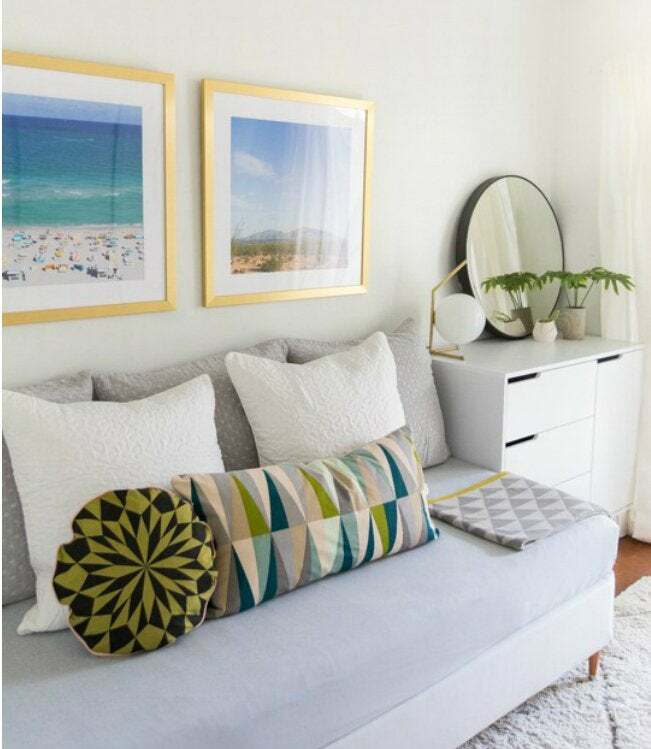 Screw them into to the bottom frame of your box spring, style with the pillows that topped the bed in its former life, and voilà—you’ve equipped your multitasking office-slash-guest room with a fashionable dual-purpose seat. For advanced woodworkers looking for a statement piece that presents more of a challenge, look no further than these daybed plans from Old Paint Design. The design mimics a herringbone pattern, with boards zig-zagging throughout the frame to create chevrons. Careful miter cuts—102 of them, to be exact—make this construction possible. Once assembled, this beautiful piece of furniture can add a healthy dose of contemporary style to any space. Popular for their rustic vibes and often zero-dollar price tag, shipping pallets have trended for years in DIY home furnishings. 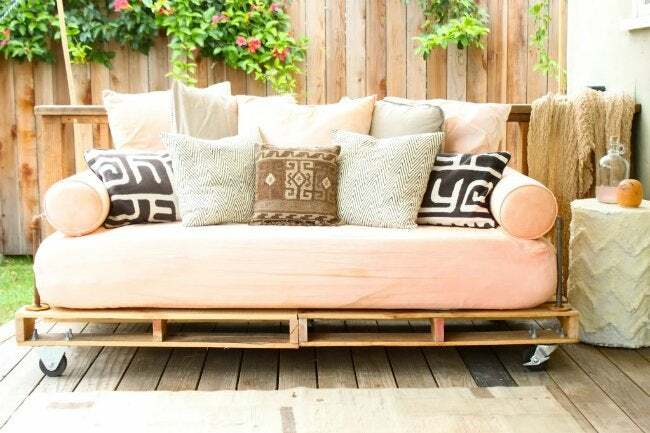 Case in point: Jaime, one of the talented ladies behind the Pretty Prudent blog, lay two pieces of this hardworking material flat to create the base of an indoor-outdoor daybed. Only a few additions are necessary to complete the structure: Industrial pipes form a set of arms that hold bolster pillows in place, while a set of casters attached to the bottom allow you to wheel your daybed outside on sunny days and back inside before temperatures drop or foul weather approaches. 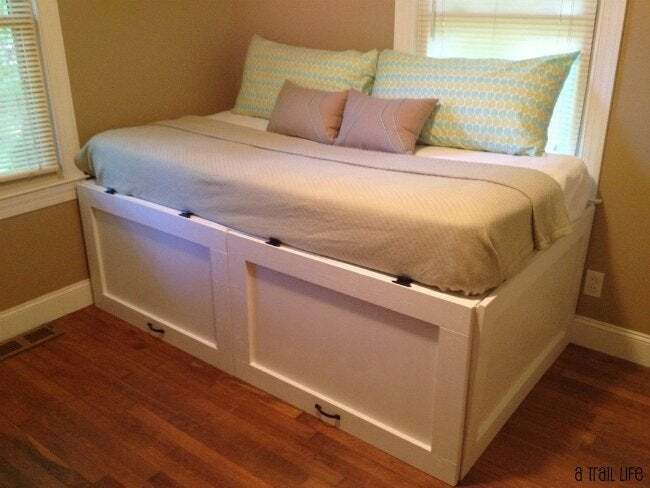 If you’re on the hunt for extra storage, consider the old standby: underneath the bed. This sort of sneaky storage can exist under a slightly more narrow daybed, all the same. While building a bed frame with cabinets from scratch might sound complicated, the photo tutorial from A Trail Life shows that it’s a totally doable (and practical) project. This handy blogger documents how to create a frame sturdy enough to support seated or sleeping guests, along with an attractive set of finished doors that will hide anything you put inside. In the end, this expert use of vertical space packs triple the function—sitting, sleeping, and stashing your stuff—all under the same footprint.